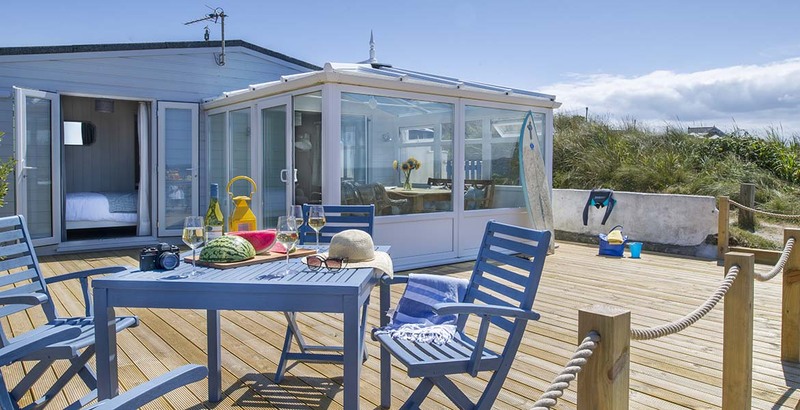 Miles of golden sand, scenic coastal walks and a wide selection of water sports and activities are all within easy reach from this modest yet spacious beach chalet, nestled amidst the sand dunes just behind the fabulous Godrevy beach. 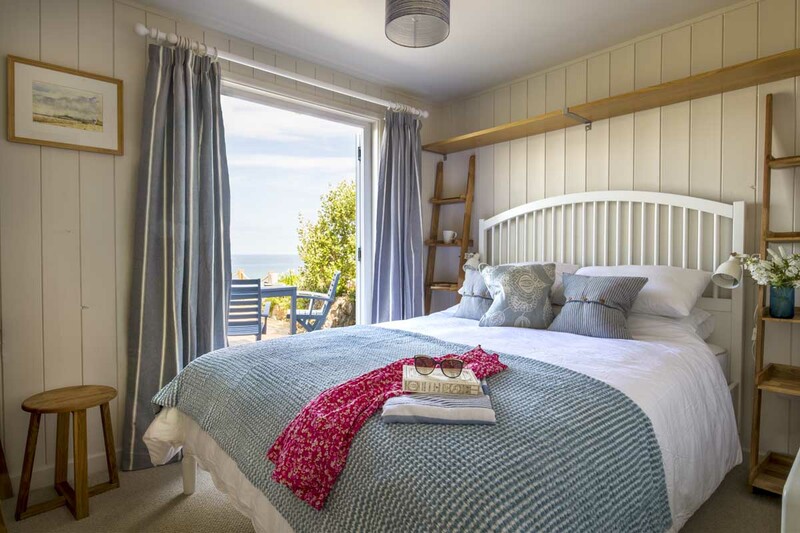 This comfortable home has been lovingly restored, providing the right amount of luxury and the perfect ‘home-from-home’ feel, and is the ideal retreat for couples and small families looking for unbeatable views and excellent proximity to some of Cornwall’s best beaches and towns. Surfside beach chalet is tastefully and practically decorated in greys, clean lines and nautical themes, and whilst it has been recently renovated, you will find that the accommodation maintains a cool beach-side, rustic-chalet feel. Step into Surfside through the bright conservatory that houses a large dining table — enjoy breath-taking sea views every time you dine! The living room is next door, where you will spot stylish and lovely vintage furniture all around, and offers a practical and pleasing flooring space and more beautiful sea views…180 degrees from Godrevy to St Ives! The kitchen is utterly contemporary and very well equipped, with a trendy breakfast bar, making it another wonderful area in which to relax with family or friends. The master bedroom (with a king-sized bed) shares the same dramatic views as the conservatory area, so you will be torn between staying in bed and enjoying looking at the beach, or getting out and being on it. 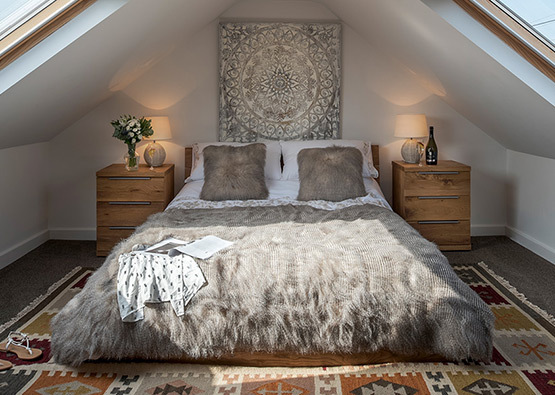 The second bedroom is opposite containing two 2’6” beds, and both rooms are finished in crisp white linen. A lovely family bathroom completes the accommodation. The whole chalet is laid out on one level, making it easily accessible for those with mobility issues, and has one allocated car parking space nearby; a much-sought after asset in this area! 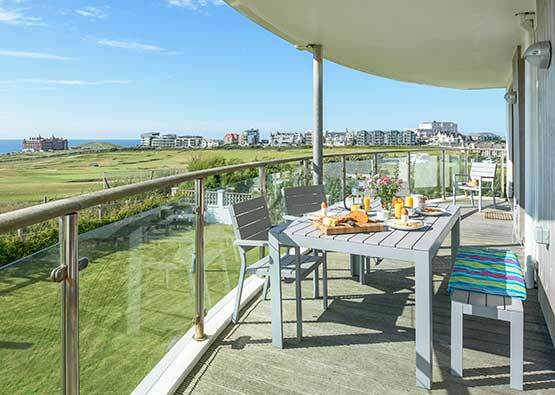 Once outside you’ll find a generous decked terrace that looks out over sand-dunes to the sweep of St Ives Bay, complete with a high-quality barbecue and a cold après-surf outdoor shower. Toys and games complete Surfside and provide all you could ever need for a fabulous holiday! The beaches here are some of Cornwall’s best. Lifeguarded in the main holiday season, Gwithian and Godrevy boast miles of sand, scores of enticing rockpools great for children, beachcombing, surfing, windsurfing, kite surfing and sun-worship. The miles of marram-covered sand dunes (the “Towans”) are dog friendly at all times, and the South West Coast Path runs for as far as your legs will carry you in either direction. But of course it’s the view that defines Surfside — you’ll be looking westward across the sweep of the beach to St Ives. At most times of year you’ll enjoy watching the sun plunge over the horizon and the lights of St Ives and Carbis Bay come alive in the darkness over the water. What ever it is that you seek from a fabulous holiday, Surfside is bound to tick all of the boxes. The beaches of Godrevy and Gwithian Towans are tucked away treasures on the North coast of Cornwall, backed by picturesque sand dunes that run alongside them. These unspoilt, golden beaches stretch along the easterly side of St Ives Bay, and as west facing beaches they bask in the summer sun all day long. With several surf schools lining the beach, Gwithian is a surfing mecca and is an area perfect for those wanting to try surfing for the first time or polish up their skill! Aside from the beaches, the towans (golden dunes) are a particular favourite for sunset watching and barbeques, and with the cliffs at the end of Godrevy, this spectacular landscape makes up a section of the famous Cornish coastal footpath. We believe Godrevy and Gwithian holds the formula for the perfect Cornish beach retreat. 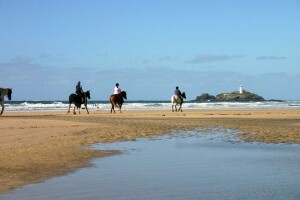 When the tide is low, Gwithian and Godrevy are connected to other beaches that lead all the way to Hayle estuary. This three mile expanse is formed by Upton Towans, Mexico Towans, Godrevy, Gwithian and Hayle beach, which sits at the mouth of the estuary. 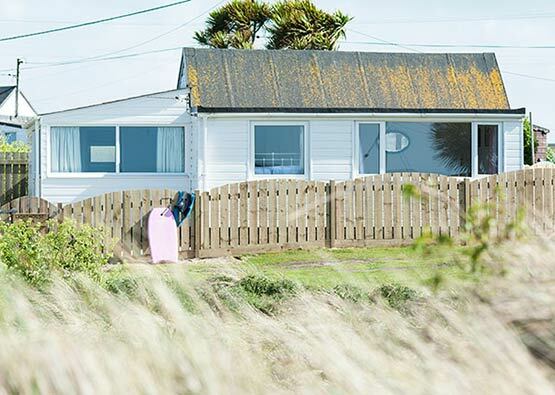 Both Upton Towans and Mexico Towans allow dogs all year round, and the next beach over from Hayle beach — Porthkidney — is also dog friendly, so there’s plenty of space to let the dogs run. Seasonal lifeguards serve Gwithian and Godrevy, so they’re great for those wanting to get in the water – but do respect the sea and avoid going in the water when the lifeguards are off-duty. You’ll find plenty of people in the water on these beaches, and although the majority will be surfers, there are plenty of windsurfers, kite-surfers and paddle-boarders about too, providing scenes of real adrenaline for onlookers on dry land. 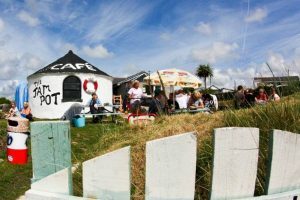 The popular Sunset Surf Café, and the iconic Jam Pot café are great to watch the watersports from, and also act as a cosy place to warm up after a swim or surf. While Gwithian is completely sandy, Godrevy offers a pebbled area which is perfect for barbecues on the beach and sea fishing, while the sandy side of Godrevy offers a more secluded space. Godrevy is owned by The National Trust, and is an Area of Outstanding Natural Beauty (AONB), with a particularly beautiful stretch of the South West Coast Path, featuring a picture perfect view of Godrevy Island and the lighthouse — which inspired Virginia Woolfe — that sits on it. 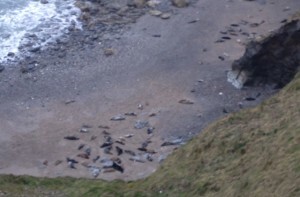 This footpath also takes you to the cliffs above Mutton Cove where you can often see over 100 seals if the timing is right! 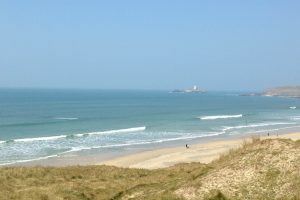 The dunes behind Godrevy are also home to St. Gothian Sands Nature Reserve, which has developed into a haven for birdwatchers and wildlife enthusiasts alike. Gwithian village sits set back from the beach, hidden from view by the rolling towans. This small hamlet is extremely pretty, and the local pub, the Red River Inn is a great place to grab a bite to eat and sample some local ales. For amenities and entertainment besides what can be found on the beach, head a few miles west of Gwithian to Hayle. This local town has plenty of supermarkets, restaurants and shops, while on the outskirts you will find some great farm shops – try Richard’s or Trevaskis Farm for your fresh fruit and veg. Beyond Hayle is also where you’ll find the dog-friendly Porthkidney beach, and just a few miles further across the bay is St Ives. This beautiful town is a hive of activity during the summer, with local boutiques, restaurants and art galleries offering plenty to do all in a picturesque setting. For those looking to escape the crowds, a visit to St Ives out of season is a must. Its rich history of artists is commemorated by numerous museums and galleries, including the Tate St Ives and the Barbara Hepworth museum. 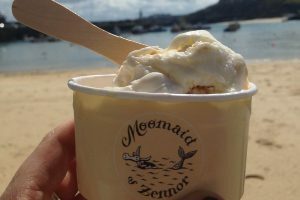 St Ives is a great place to explore for anyone visiting the area, and why not make a day of it by including a stroll or sunbathe on the towns’ two main beaches, Porthmeor and Porthminster. With all the attractions, shopping opportunities, wildlife spotting and long sandy beaches it is no surprise that the Gwithian and Godrevy area is a popular spot for holidays. 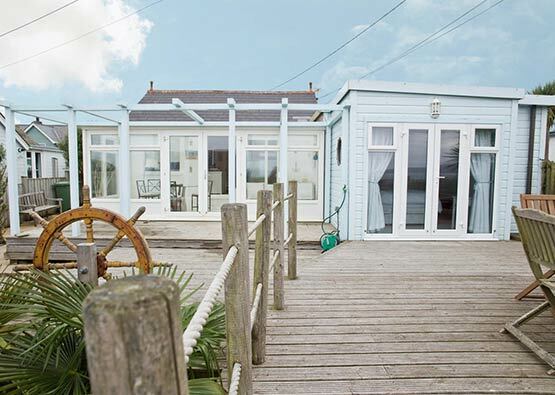 Our range of beach houses, chalets and cottages are mostly dog friendly and perfect for a relaxing break in Cornwall. Newquay Airport is 34 miles from Surfside Beach House. You can fly to Newquay from London Gatwick, Manchester and the Isles of Scilly all year round with summer flights to and from London Stansted, Edinburgh, Aberdeen, Birmingham International, Doncaster Sheffield, Newcastle, Belfast City, Dublin and Düsseldorf. Airlines include Flybe, Aer Lingus, Skybus and Eurowings. 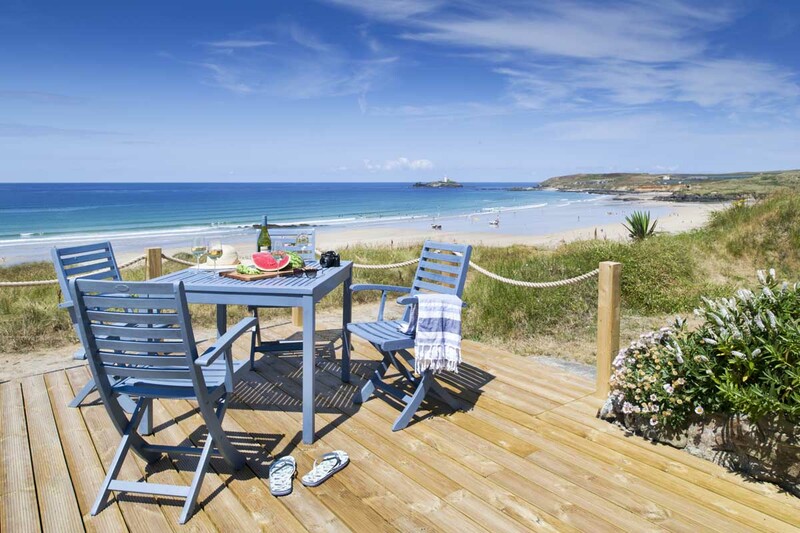 Surfside Beach House is situated in Gwithian Towans, on Cornwall’s North Coast coast adjacent to the delightful village of Gwithian, just five minutes north east of Hayle on the B3301. Driving time from London is around five hours in normal traffic, while Exeter is around two hours away. We’ll send you detailed route information before your departure. 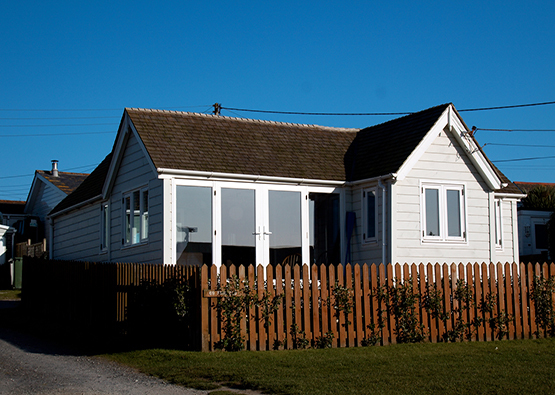 Surfside Beach House is about 12 miles from the nearest mainline station at Camborne. Regular and convenient services run from all over the UK. Gwithian — possibly the best beach in the world? We have had a wonderful week; the weather has been very kind to us and the doggies. We have been coming to Surfside for a long time and have loved the refurbishment! There is no better view in Cornwall, all in all a super week was had by all of us. We have had a fantastic week here, thank you. The views are outstanding — I think we could have sat still all week watching. Beautiful walks and runs from the cottage. Seeing the seals and birds was very special. Bellyboarding, surfing and attempts at paddle-boarding were all great fun. The weather was very king to us and we have been able to enjoy the local cafes sitting outside all week. Hopefully we will be back very soon, as we hope that all that visit here feel as relaxed and happy as we have felt all week. A blissful week of sunshine, surfing with seals and lots of cake and coffee at the various local spots. We enjoyed a meal at the dog friendly pub in the village; luckily I booked ahead as the Saturday night was packed! Also took the scenic train line to St Ives; definitely the way to go as avoids the parking chaos. Otherwise didn't go far, enjoyed walks, reading and the glorious views. A treat in any weather. Thanks for a great stay. This isn't the first time we have stayed in this property, been coming here over ten years or more! Can safely say the property has been refurbished to the best standard we have seen — very relaxing. Can't ask for anything better than this location and view. Ben paddling every day even though it's October. It's always a fantastically relaxing holiday. Will definitely be back next year.